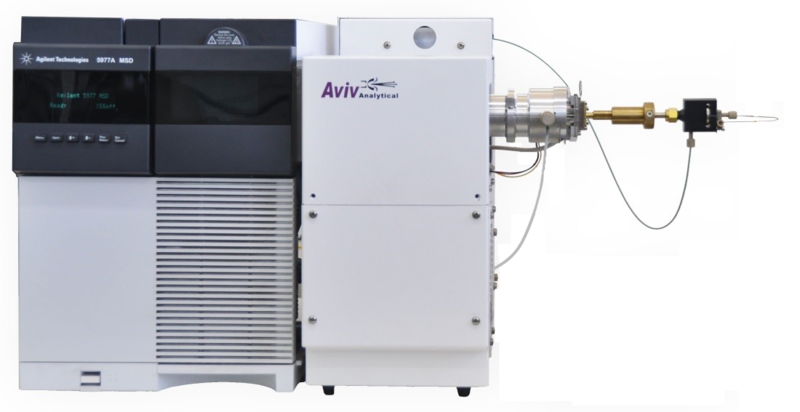 Aviv Analytical is proud to provide its Electron Ionization LC-MS. The interface converts a standard Agilent 5977 MSD into Electron Ionization LC-MS with Supersonic Molecular Beams (SMB) (Cold EI) as shown in the photo below. Electron ionization (EI) significantly benefits LC-MS through the provision of automated library identification and extensive fragment information which are ideally suitable for LC-MS identification of unknown compounds. In addition, the complete elimination of matrix ion suppression effects facilitates faster analysis and the EI uniform ionization yields (unlike ESI/APCI/APPI) enables sample semi-quantitative determination without identification, standards preparation and calibration. Based on over a decade of research, the Aviv Analytical EI-LC-MS with SMB finally brings back EI to LC-MS with a reliable and robust EI interface that is compatible with standard flow rates. - Library searchable EI mass spectra are provided, enabling automated identification with sample compounds names and structures at the isomer level. - High quality EI mass spectra are provided with enhanced molecular ions and isomer mass spectral effects. - Uniform semi-quantitative response is provided for a broad range of compounds including highly non-polar samples. - Ion suppression and/or enhancement effects are fully eliminated. - Fast LC-MS analysis is facilitated through the elimination of matrix related ion suppression effects. In some cases flow injection can replace lengthy LC-MS methods. - No nitrogen gas generator and air compressor are needed (improved transportability). - The same EI-LC-MS with SMB system can be converted into GC-MS with Cold EI via the change of its vaporization chamber transfer line only. The Aviv Analytical EI-LC-MS with SMB is based on a novel approach (3 US patents) of interfacing LC and MS with supersonic molecular beams (SMB) and electron ionization of vibrationally cold sample compounds in the SMB. The output of the LC is sprayed using a special pneumatic sprayer at about 1.5 atm into a deactivated glass tube (GC injector liner) which acts as a vaporization chamber in which the spray droplets and emerging sample particles are fully vaporized. The vaporized sample compounds are transferred via a short deactivated fused silica capillary into a supersonic nozzle and expand into the vacuum system from a 300 µm supersonic nozzle at about 0.2 Bar nozzle backing pressure to suppress cluster formation while obtaining efficient vibrational cooling. The analytes are then ionized inside an inherently-inert-fly-through EI ion source and are passed into the unmodified 5977 MSD quadrupole mass analyzer and its ion detector. The addition of a short flow restriction capillary does not contribute to sample degradation since the critical step that could affect sample degradation is the process of sample vaporization from its spray which is similar to that in APCI or APPI. Consequently, our novel approach provides a robust EI-LC-MS interface with easy service which is similar to that of APCI. Another benefit of the use of capillary separated vaporization chamber and nozzle is the ability to have GC-MS with SMB (Cold EI) and LC-MS with SMB in one system with easy interchange between these two modes of operation via a change of the vaporization chamber and transfer line only. In the near future this mode changing will be automated via a click of the mouse (ask us about it). You can read a publication on EI-LC-MS with SMB at B. Seemann, T. Alon, S. Tsizin, A. B. Fialkov and A. Amirav "Electron Ionization LC-MS with Supersonic Molecular Beams – The New Concept Benefits and Applications" J. Mass. Spectrom. 50, 1252-1263 (2015). For further details and specifications please communicate with us and ask for the Aviv Analytical quote for its EI-LC-MS with SMB. Please share with us your specific analysis needs and let us explore together the optimal EI-LC-MS with SMB solution. We shall be happy to demonstrate our EI-LC-MS with SMB for you on your sample.